Newton Baroque is especially committed to calling attention to fine music outside the Baroque canon. As an example, in 2011 Newton Baroque joined with the early music vocal ensemble Exsultemus for all 72 cantatas of Georg Telemann’s Harmonischer Gottesdienst, an unprecedented performance project that met with widespread acclaim. Based in Boston for the past ten years, Newton Baroque took a spectacular leap onto the national stage in May 2014 when they performed three exciting innovative programs as a featured ensemble at the American Bach Society annual convention at Kenyon College in Ohio, garnering an overwhelming response from some of the most knowledgeable Bach scholars in the world. In 2015 Newton Baroque will release two recordings of rarely heard Baroque music: masterful and moving arias from Philipp Heinrich Erlebach’s Harmonischer Freude musicalischer Freunde with Boston mezzo-soprano Shiba Nemat-Nasser, and again in consort with Exsultemus, a recording of extraordinarily beautiful Vespers music by Johann Caspar Fischer. 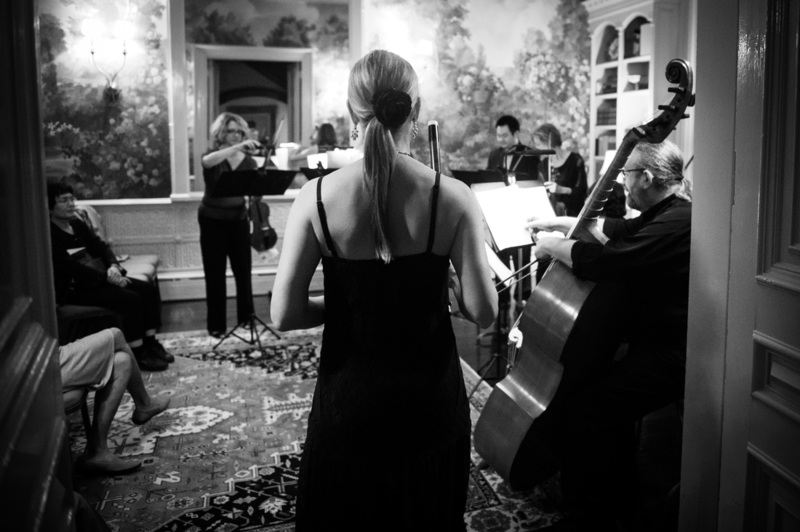 Depending on the requirements of the chosen repertoire, Newton Baroque draws on its roster of musicians who work frequently with the group, comprising some of the leading Baroque specialists both nationally and internationally. Core members include: Susanna Ogata, Jesse Irons, Katherine Winterstein, Jane Starkman, Laura Jeppesen, Mary Oleskeiwicz, Sarah Freiberg Ellison, Jay Elfenbein, and Douglas Kelley. Also this year we will be joined by superb vocal stars like Teresa Wakim and Pamela Dellal. Newton Baroque frequently appears during services at their home base at Second Church in Newton, Mass. (UCC), which also serves as a superb concert venue for the ensemble. They have also appeared numerous times on Boston’s SoHIP concert series, on WGBH Radio, Boston, and on various concert series in New York City. Andrus Madsen is an active performer on the organ, harpsichord clavichord and fortepiano. He resides in Wayland MA, and is the Minister of Music at Second Church in Newton MA. He is the founding director of Newton Baroque and also plays with Exsultemus. He spearheaded a project combining the forces of Newton Baroque and Exsultemus to perform the entire Harmonischer Gottesdienst cantata cycle of Georg Phillip Telemann during the year of 2011. Madsen is also known for his eloquent Baroque style improvisation. He strives to play written repertoire as if he is improvising, while his improvisations often sound as if they had been notated. His recording of keyboard music by Pachelbel, has received significant critical acclaim. “Superb recordings of superb instruments by a musician who deserves to be better-known.” (Michael Barone of pipedreams) This album, played on organ, harpsichord and clavichord is available on Raven CD Recordings. Susanna Ogata enjoys an active performance schedule in greater New England and beyond. She has been praised for ‘totally convincing, spontaneous and free-flowing playing” (The Berkshire Review) and her musical “sensitivity and fire” (Boston Musical Intelligencer). Ms. Ogata is dedicated to performance on period instruments and is the Assistant Concertmaster of the Handel and Haydn Society. She has also participated in concerts and appeared as soloist with such groups as the Bach Ensemble led by Joshua Rifkin, Arcadia Players, Newton Baroque, and Blue Hill Bach. She is a founding member of several period instrument chamber ensembles including the Boston Classical Trio, Copley String Quartet, and the Coriolan String Quartet. She has also performed on the Sarasa, Music at Eden’s Edge, Cambridge Society for Early Music, and Boston Early Music Festival series concerts. With fortepianist Ian Watson, her first of four CDs surveying the complete Sonatas for Fortepiano and Violin of Beethoven has been recently released on the CORO label receiving praise for “elegant readings that are attentive to quicksilver changes in dynamics and articulation. Their performance of the Sonata No. 4 in A minor is darkly playful, their “Kreutzer” Sonata brilliant and stormy.” (New York Times) Ms. Ogata’s teachers have included Charles Castleman and Laura Bossert, and she has studied baroque violin with Dana Maiben. She also worked extensively with Malcom Bilson and Paul O’Dette while completing her undergraduate and graduate studies at the Eastman School of Music. Praised by critics for “livewire intensity” and for both “delightfully effective” and “memorably demonic” playing, violinist Katherine Winterstein enjoys a wide range of musical endeavors, as a chamber musician, orchestral musician, soloist, and teacher. Ms. Winterstein is the concertmaster of the Vermont Symphony, a member of the Rhode Island Philharmonic, and performs regularly with the Handel and Haydn Society, Boston Baroque, and the Boston Modern Orchestra Project. She is a member of the Hartt String Quartet and additionally appears regularly with Boston-based Chameleon Arts Ensemble and Providence-based Aurea Ensemble She has performed with the Craftsbury Chamber Players in Vermont for 13 summers. Ms. Winterstein has appeared as soloist with several orchestras, including the Wintergreen Festival Orchestra, the Champlain Philharmonic, the Boston Virtuosi, and the Vermont Symphony. She has served on the performance faculty of Middlebury College in Vermont since 2002 and joined the faculty of the Hartt School of Music in September 2011. Jane received B.M. and M.M. degrees from the New England Conservatory of Music. She continued her studies in Basel, Switzerland at the Schola Cantorum with Jaap Schroeder and in New York with William Lincer. While living in Basel she performed with the Radio Orchestra Basel. Ms. Starkman has performed as both a violinist and violist with many groups in the US and abroad. In Europe she has performed with the Cologne Chamber Orchestra, Capella Clementina as well as ensembles in the Netherlands and Italy. 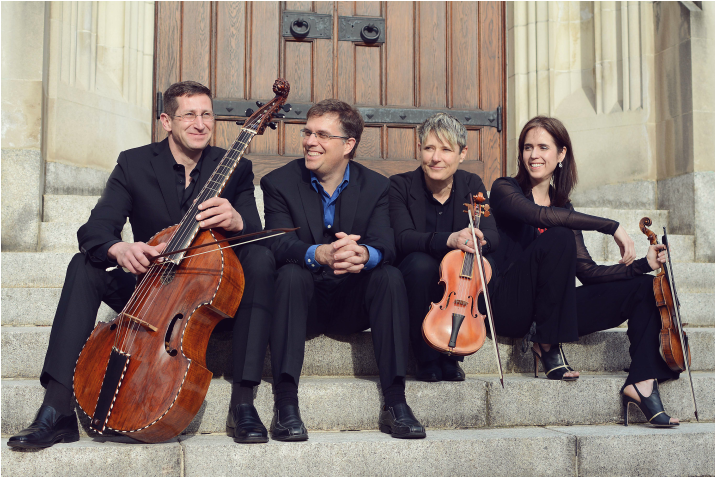 Some of the ensembles Ms. Starkman performs with include the Handel and Haydn Society, Boston Baroque, Smithsonian Chamber Players, Ensemble Florilege, La Donna Musicale, and the Aston Magna Festival as well as being a founding member of The King’s Noyse. Ms. Starkman teaches at Oberlin College’s Baroque Performance Institute, Boston University, Wellesley College and has been a guest clinician at the Massachusetts Suzuki Festival and the New England Conservatory of Music. Hailed as “…one of the greatest baroque flutists of our time” (American Record Guide, 2014), Mary Oleskiewicz enjoys a unique career as performer-scholar. After winning first prizes in both the National Flute Association’s Baroque Flute Artist and Doctoral Dissertation Competitions, she quickly established herself as an international performer of historical flutes and the leading expert on the flutist, theorist and composer Johann Joachim Quantz. She is an authority on music at the 18th-century court of the Prussian King Frederick “the Great,” and her highly acclaimed essays, editions and recordings have focused on the music of Quantz, C.P.E. Bach, King Frederick, and the Bach family. Her solo recordings are published on the Hungaroton Classic and Naxos labels. A world premiere CD of 18th-century flute concertos, performed with Miklós Spanyi and Concerto Armonico, has been just released. Mary serves as Associate Professor of Music at the University of Massachusetts and is a frequent guest professor at Queen’s College in New York City. A fluent German speaker, during 2008-2009 she taught performance practice in the Early Music program at the University of the Arts in Berlin. Previously she served as Professor of Flute at the University of South Dakota, and Curator of Musical Instruments at the National Music Museum. She has held several prestigious multi-year fellowships from the Alexander von Humboldt Foundation and the DAAD. In addition to her scholarly pursuits, Mary dances and teaches Argentine tango, plays the bandoneon, and improvises on Native American flutes. For more about Mary, visit BaroqueFlutist.com. Laura Jeppesen, viola and viola da gamba, has a master’s degree from Yale University and studied at the Hamburg Hochschule, and at the Brussels Conservatory with Wieland Kuijken. She has been a Woodrow Wilson Designate, a Fulbright Scholar, and a fellow of the Bunting Institute at Harvard. A prominent member of Boston’s early music community, she has long associations with The Boston Museum Trio, Boston Baroque, The Handel and Haydn Society, the Boston Early Music Festival and Aston Magna. In 2015 she was part of the BEMF team that won a Grammy for best opera recording. She has performed as soloist with conductors Christopher Hogwood, Edo deWaart, Seiji Ozawa, Craig Smith, Martin Pearlman, Harry Christophers, Grant Llewellyn, and Bernard Haitink. She has an extensive discography of solo and chamber works, including the gamba sonatas of J.S.Bach, music of Marin Marais, Buxtehude, Rameau, Telemann and Clerambault. She teaches at Boston University, Wellesley College and is a teaching assistant at Harvard University. Jay Elfenbein (bass, violone, baroque bass, basse de violon, viola da gamba, Ruby gamba [electric], vihuela d’arco, vielle, rebab): The performances of Jay Elfenbein have been described by the New York Times as “played magnificently” and “with virtuosity and flair.” Principal bassist and violone player with Boston Early Music Festival Orchestra, Opera Lafayette, and the Washington Bach Consort, among others, he has also appeared as a viola da gamba soloist in both Bach Passions throughout the Northeast, and the Kennedy Center (Washington, DC), and on basse de violon with Tragicomedia, the Portland Baroque Orchestra, and others. He has recorded for Sony Classics, CBS, and Virgin, among others, and can be heard playing vihuela and vielle on Paul Simon’s Warner Brothers release, You’re the One, and on Absolute Zawinul, one of Joe Zawinul’s final recordings. Jay is the founder and director of the Ivory Consort, the medieval ensemble that receives critical raves for both its live concerts and its CDs, Music in the Land of Three Faiths and Troubadours Across the Pyrenees, and GambaDream, the creative new jazz/contemporary ensemble that features Mr. Elfenbein on electric viola da gamba on an adventurous self-titled CD. He is a published composer whose work has been commissioned and performed in the U.S., Japan, Canada, Europe and South America. Daniel S. Lee enjoys a varied career as a soloist, chamber musician, concertmaster, and teacher. Praised for his “ravishing vehemence” and “fleet-fingered, passionate… soulful performance” (The New York Times), he has appeared as a soloist and guest leader with Early Music New York, New York Baroque Incorporated, Quodlibet Ensemble, San Francisco Bach Choir, TENET, Trinity Baroque Orchestra, and Yale Schola Cantorum. He has also performed for the 4×4 Baroque Music Festival, Connecticut Early Music Festival, Internationale Bachakademie Stuttgart, NYS Baroque, Pegasus Early Music, and York Early Music Festival. As a modern violinist, he made his Carnegie Hall debut at age sixteen performing alongside Itzhak Perlman, Pinchas Zukerman, and the Israel Philharmonic Orchestra. He founded and co-directs the Sebastians, a period ensemble lauded for its “stylistic authority and rhythmic verve” (The New York Times). As a violino piccolo specialist, he frequently appears as a soloist in Bach’s first Brandenburg Concerto and cantata 140, and has given the modern-day premiere of his own transcription of Johann Pfeiffer’s concerto. A graduate of the Juilliard School and Yale University and a doctoral student at the University of Connecticut, he is currently on the violin, viola and chamber music faculty at Connecticut College and the University of Bridgeport.